St. Patrick's Day Special, 30% Off! This white Irish vest with sequined green shamrocks is ideal for your St. Patrick's Day costume or for any Irish themed party. 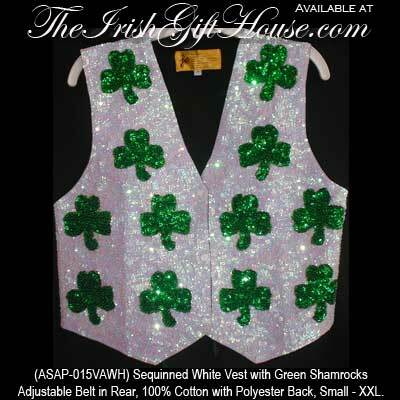 The white Irish vest from The Irish Gift House features sequined green shamrocks and it would complete your St. Patrick's Day costume. The St. Patrick's day vest is 100% cotton with a polyester back and has an adjustable belt in the rear. This shamrock vest is available in very limited sizes.